Distributional information can be accessed in two different ways within this website. To determine the fauna of a particular geographic region, click on the maps that appear within this section. As you progress through the maps, both the area covered and the taxa included are narrowed. For example, this page, which includes a global map, notes those continents inhabited by solifuges and those that are devoid of solifuges. If you click on one of the contintents, you will be referred to a map of that continent and the page bearing that map will reference the families of solifuges that occur on that continent. Pages bearing country and state maps provide lists of the genera and species occuring therein. Alternatively, you may access distributional information from the pages in the TAXONOMY section of the website, where the distribution of each taxon is noted on the page devoted to that taxon. For those taxa included in our Systematic Revision and Biogeography of the Eremobatidae project (funded by National Science Foundation grants 1754587 and 1754030), links to the most current distribution map generated from the Symbiota Collections of Arthropods Network database are presented. Solifuges occur on all continents except Australia and Antarctica. They are also absent from Madagascar and New Zealand. Four of the twelve recognized families are represented in the Western Hemisphere, where members of the families Ammotrechidae, Eremobatidae, and Mummuciidae exclusively occur. The families Ceromidae, Galeodidae, Gylippidae, Hexisopodidae, Karschiidae, Melanoblossiidae, Rhagodidae and Solpugidae are restricted to the Eastern Hemisphere. 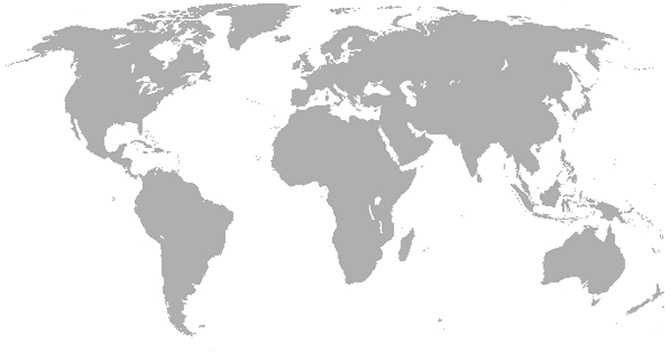 One family, the Daesiidae, is present in the souhern part of both hemispheres. Click on the map above to further explore the distribution of solifuges. U. S. Copyright Act. They may not be "borrowed" or otherwise used without express permission. For permission, please submit your request to wsavary@yahoo.com.